"FIU" redirects here. For other uses, see FIU (disambiguation). 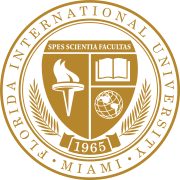 Florida International University (FIU) is a metropolitan public research university in Greater Miami, Florida. FIU has two major campuses in Miami-Dade County, with its main campus in University Park. Florida International University is classified as a research university with highest research activity by the Carnegie Foundation and a research university by the Florida Legislature. FIU belongs to the 12-campus State University System of Florida and is one of Florida's primary graduate research universities, awarding over 3,400 graduate and professional degrees annually. The university offers 191 programs of study with more than 280 majors in 23 colleges and schools. FIU offers many graduate programs, including architecture, business administration, engineering, law, and medicine, offering 81 master's degrees, 34 doctoral degrees, and 3 professional degrees. FIU is the largest university in South Florida, the second-largest in Florida, and the fourth-largest in the United States by enrollment. Total enrollment in Fall 2016 was 55,112 students, including 8,770 graduate students. According to U.S. News college rankings and reviews, 92% of FIU students live off-campus while only 8% of students live in "college-owned, college-operated or college-affiliated" housing. The story of Florida International University's founding began in 1943, when state Senator Ernest 'Cap' Graham (father of future Florida governor and U.S. senator Bob Graham) presented the state legislature with the initial proposal for the establishment of a public university in South Florida. While his bill did not pass, Graham persisted in presenting his proposal to colleagues, advising them of Miami's need for a state university. He felt the establishment of a public university was necessary to serve the city's growing population. In 1964, Senate Bill 711 was introduced by Florida Senator Robert M. Haverfield. It instructed the state Board of Education and the Board of Regents (BOR), to begin planning for the development of a state university in Miami. The bill was signed into law by then-governor W. Haydon Burns in June 1965, marking FIU's official founding. FIU's founding president Charles "Chuck" Perry was appointed by the Board of Regents in July 1969 after a nationwide search. At 32 years old, the new president was the youngest in the history of the State University System and, at the time, the youngest university president in the country. Perry recruited three co-founders, Butler Waugh, Donald McDowell and Nick Sileo. Alvah Chapman, Jr., former Miami Herald publisher and Knight Ridder chairman, used his civic standing and media power to assist the effort. In the 1980s, Chapman became chair of the FIU Foundation Board of Trustees. The founders located the campus on the site of the original Tamiami Airport (not related to the later Kendall-Tamiami Airport) on the Tamiami Trail (U.S. Route 41) between Southwest 107th and 117th Avenues, just east of where the West Dade Expressway (now the Homestead Extension of Florida's Turnpike) was being planned. The abandoned airport's air traffic control tower became FIU's first building. It originally had no telephones, no drinking water, and no furniture. Perry decided that the tower should never be destroyed, and it remains on campus, where it is now known variously as the "Veterans Office," "Ivory Tower," the "Tower Building," or the "Public Safety Tower," and is the former location of the FIU Police Department. The Graham Center, FIU's student union. Over 3.5 million people walk through the Graham Center every year, making it the heart of student life at FIU. In September 1972, 5,667 students entered the new state university, the largest opening day enrollment at the time. Previously, Miami had been the largest city in the country lacking a public baccalaureate-granting institution. Eighty percent of the student body had just graduated from Dade County Junior College (now Miami-Dade College). A typical student entering FIU was 25 years old and attending school full-time while holding down a full-time job. Forty-three percent were married. Negotiations with the University of Miami and Dade County Junior College led FIU to open as an upper-division only school. It would be nine years before lower-division classes were added. The first commencement, held in June 1973, took place in the reading room of the ground floor of Primera Casa – the only place large enough on campus for the ceremony. More than 1,500 family members and friends watched FIU's first class of 191 graduates receive their diplomas. By late 1975, after seven years at the helm, Charles Perry felt he had accomplished his goal and left the university to become president and publisher of the Sunday newspaper magazine Family Weekly (later USA Weekend), one of the country's largest magazines. When he left, there were more than 10,000 students attending classes and a campus with five major buildings and a sixth being planned. Harold Crosby, the university's second president and the founding president of the University of West Florida in Pensacola, agreed in 1976 to serve a three-year "interim" term. Under his leadership, FIU's North Miami Campus (which was officially renamed the Bay Vista Campus in 1980, the North Miami Campus in 1987, the North Campus in 1994, and the Biscayne Bay Campus in 2000) – located on the former Interama site on Biscayne Bay – was opened in 1977. State Senator Jack Gordon was instrumental in securing funding for the development of the campus. President Crosby emphasized the university's international character, prompting the launching of new programs with an international focus and the recruitment of faculty from the Caribbean and Latin America. President Crosby's resignation in January 1979 triggered the search for a "permanent" president. Gregory Baker Wolfe, a former United States diplomat and then-president of Portland State University became FIU's third president, from 1979 to 1986. After stepping down as president, Wolfe taught in the university's international relations department. The student union on the Biscayne Bay Campus is named in his honor. Modesto A. Maidique assumed the presidency at FIU in 1986, becoming the fourth in the university's history. Maidique graduated with a Bachelor of Science, Master of Science, and PhD in Electrical Engineering from Massachusetts Institute of Technology (MIT), before joining the private sector. He held academic appointments from MIT, Harvard and Stanford Universities, and has been named to several US Presidential boards and committees. Under his leadership, FIU heralded in an era of unprecedented growth and prestige with all facets of university undergoing major transformations. Physically, the university tripled in size and its enrollment grew to nearly 40,000. During his 23 years as president, the school established the Herbert Wertheim College of Medicine, the FIU College of Law, the FIU School of Architecture and the Robert Stempel School of Public Health. Also during his tenure, endowment grew from less than $2 million to over $100 million. During Maidique's tenure, the university added 22 new doctoral programs. Research expenditures grew from about $6 million to nearly $110 million as defined by the National Science Foundation. In 2000, FIU attained the highest ranking in the Carnegie Foundation classification system, that of "Doctoral/Research University-Extensive." FIU's faculty has engaged in research and holds far-reaching expertise in reducing morbidity and mortality from cancer, HIV/AIDS, substance abuse, diabetes and other diseases, and change the approaches to the delivery of health care by medical, public health, nursing and other healthcare professionals, hurricane mitigation, climate change, nano-technologies, forensic sciences, and the development of biomedical devices. The arts also flourished while Maidique was at the helm, with the university acquiring The Wolfsonian-FIU Museum on Miami Beach and building the Patricia and Phillip Frost Art Museum on its main campus. In athletics, FIU made inroads in becoming a powerhouse athletic university during Maidique's time as president and he championed the eventual establishment of a NCAA football program. Finally, the school earned membership into Phi Beta Kappa, the nation's oldest honor society. Maidique was the second longest-serving research university president in the nation. Now President Emeritus, he currently serves as the Alvah H. Chapman, Jr., Eminent Scholar Chair in Leadership and Executive Director of the Center for Leadership and Professor of Management at FIU. On November 14, 2008, Maidique announced that he would be stepping down and asked FIU's Board of Trustees to begin the search of a new president. He said he would remain president until a new one was found. On April 25, 2009, Mark B. Rosenberg was selected to become FIU's fifth president. He signed a five-year contract with the Board of Trustees. On August 29, 2009, Rosenberg became FIU's fifth president. Having started as a two-year upper division university serving the Miami area, FIU has grown into a much larger traditional university and serves international students. More than $600 million has been invested in campus construction, with the addition of new residence halls, the FIU Stadium, recreation center, student center, and Greek life mansions, as well as the fielding of the Division I-A Golden Panthers football team in 2002. Since 1986, the university established its School of Architecture, College of Law and College of Medicine (named the Herbert Wertheim College of Medicine in 1999 after Herbert Wertheim donated $20 million to the college, which was matched by state funds and is the largest donation in the university's history), and acquired the historic Wolfsonian-FIU Museum in Miami Beach. FIU's School of Hospitality & Tourism Management collaborated with China's Ministry of Education to work on preparations for the 2008 Summer Olympics. FIU was the only university in the United States invited to do so. Royal Caribbean is building a $20 million 130,000 sq. ft. training facility for its performers at the school. It is scheduled to open in 2015. The buildings will serve architecture, art, and hospitality students including lighting, set design, marketing, and other internship and training opportunities. On October 2, 2014, it was announced that Florida International University would play host to the Miss Universe 2014 pageant on January 25, 2015. FIU also hosted a talk from President Barack Obama in February 2015. On March 15, 2018, a newly-constructed pedestrian bridge collapsed outside the university, resulting in several fatalities. In 2008, 7% of FIU students were international students. Of those, the most popular countries of origin were: China (20%), India (13%), Jamaica (10%), Venezuela (6%), Colombia (5%), and Trinidad and Tobago (4%). Students from New York, New Jersey, and California make up the largest states for out-of-state students. Floridians make up 90% of the student population. Miami-Dade, Broward, Palm Beach, Hillsborough, and Orange County make up the largest Florida counties for in-state students. University Park accounted for 87% of the student population and 94% of housing students. The Biscayne Bay Campus accounted for about 13% of the student population, mostly of lower-division undergraduates and students of the School of Hospitality & Tourism Management. Fall 2009, the average age for undergraduates was 23 and 31 for graduate students. Enrollment for Fall 2014 consisted of 54,099 students, 45,359 undergraduates and 7,814 graduate students, including students enrolled in professional programs. Women accounted for 56.2% of student enrollment and minorities made up 88% of total enrollment. Enrollment included students from all 50 U.S. states and more than 119 countries. The most popular College by enrollment is the College of Arts and Sciences. The freshman retention rate for 2009 was 83%. The fall 2011 incoming freshman class had an average 3.7 GPA, 1139 SAT score, and a 25 ACT score. For Fall 2014, 8,762 students applied for graduate admissions throughout the university. Of those, 43.2% were accepted. The Wertheim College of Medicine admitted 4.6% of its applicants, and the College of Law admitted 19%. Admission to the Wertheim College of Medicine is competitive, and the college has one of the highest number of applicants in the state, greater than the University of Florida. For Fall 2010, 3,606 students applied for 43 spots. The FIU School of Architecture is the most competitive in Florida, with the lowest admission rate in the state at 14% (2011). For Fall 2009, the School of Architecture received over 1,000 applications for the first-year Master of Architecture program, with 60 being accepted, giving the School of Architecture a 6% admissions rate. The average high school GPA for the freshman class in the School of Architecture was 3.98, also making it one of the most selective schools at FIU. FIU offers 191 academic programs, 60 baccalaureate programs, 81 master's programs, 3 specialist programs, 34 doctoral programs, and 4 professional program in 23 colleges and schools. In addition, 97% of the faculty have terminal degrees, and 50% currently have tenure at the university with a student/teacher ratio of 27:1. In 2010, FIU was listed as one of 16 universities with the toughest grading system nationally. In 2000, FIU became the youngest university to be awarded a Phi Beta Kappa chapter, the country's oldest and most distinguished academic honor society. FIU is one of only 78 universities nationwide to hold both designations. U.S. News & World Report reported that FIU students are among the least indebted college students in the nation, and recognized the university as a "best buy" in higher education.The organization also reported FIU for having one of the safest campus in the United States. In 2015, FIU ranked 7th as one of the best values in public higher education in the country, according to a survey by Kiplinger's Personal Finance magazine. FIU is ranked 2nd in the U.S. for granting biology bachelor's degrees, and 6th in granting master's degrees to minorities, according to Diverse Issues in Higher Education. From 2007 to 2016, FIU ranked 1st in the State University System of Florida in energy conservation and sustainability. The College of Business is ranked the graduate school 15th for an International MBA in the U.S. and 1st in South Florida. The College of Business is accredited by the AACSB International – the Association to Advance Collegiate Schools of Business. U.S. News & World Report's "America's Best Colleges" (2015) ranks the undergraduate international business program 6th in the nation. It 2015, it ranked the Chapman Graduate School of Business 15th in the nation for an International MBA. FIU is also the only university in Florida to be ranked in the top 15 for undergraduate international business. Bloomberg Businessweek ranked the Landon Undergraduate School of Business in 2012, 11th in Operations Management, and 99th for Accounting. América Economía ranks the Chapman Graduate School of Business 48nd for an International MBA. The Financial Times (2008) ranks the Executive MBA in the top 85 MBA programs in the world, and in the top 35 among U.S. Executive MBAs. Hispanic Business (since 1998) and Hispanic Trends (since 2003) have placed the College of Business among the top 25 business schools for Hispanics. In 2008, it was ranked #8. Fortune Small Business recognized the college as among the best in the United States for entrepreneurship in its listing of "America's Best Colleges for Entrepreneurs," (August 2007), in the "Cross-Disciplinary/Cross Pollination" category. Hispanic Trends ranks the Executive MBA program 8th in its list of the best Executive MBA programs for Hispanics. QS in 2015 ranked FIU's MBA program 58th in North America. The College of Law is currently 100th in the U.S. News & World Report's law school rankings, having risen steadily from 132nd when first ranked. In 2010, the FIU College of Law was ranked among the Top 10 Best Value schools by The National Jurist. The Best Value rating was based on three criteria: bar passage rate, average indebtedness after graduation, and employment nine months after graduation. The FIU College of Law was also ranked 3rd amongst Florida schools for the scholarly impact of its faculty, behind University of Florida and Florida State University. According to the Leiter Rankings, the College of Law has already made a scholarly impact that dramatically outpaces its academic reputation. The FIU College of Law was ranked 5th in 2014 in bar passing rates in the state of Florida, and 1st in the MPRE. FIU graduates have consistently performed well on the Florida Bar Exam. Graduates achieved the highest passage rate among all Florida law schools on the July 2015, February 2016, and July 2016 exams. In 2007, the College of Law was ranked 1st in Florida in the Multistate Professional Responsibility Exam at 96%. In July 2008, the College of Law achieved a 90.6% passing rate, which placed it 2nd among Florida's ten law schools. In February 2009, the College of Law achieved an 81.5% passing rate, which placed it 1st among Florida's ten law schools. The FIU Model United Nations Program is one of FIU's premier academic programs. FIU MUN is a program of the School of International and Public Affairs and is housed within the Jack D. Gordon Institute for Public Policy and Citizenship Studies. Each year between 24 and 32 delegates participate in FIU MUN. The acceptance rate for new delegates is usually between 8 and 10 percent. FIU MUN is currently ranked as the 3rd best Model UN Team in North America and is the top ranked team in the State of Florida. FIU MUN also hosts an annual high school conference: Florida International Model United Nations (FIMUN). The conference traditionally hosts over 400 high school students from 20, or more, high schools from Miami-Dade, Broward, and Palm Beach Counties. The Journal of Criminal Justice ranks the Criminal Justice program 10th in the U.S. (November 2007). Faculty of the PhD program in social welfare rank 4th in the United States in their scholarly accomplishment, according to Academic Analytics. FIU faculty were the only social work faculty in Florida to rank in the Top 10 (December 2007). View of the campus towards Primera Casa and Deuxième Maison. The campus' oldest buildings are classic examples of Brutalist architecture. The main campus, University Park, renamed Modesto Maidique Campus in 2009, encompasses 344 acres (1.4 km²) in the Miami neighborhood of University Park, (from which the area derives its name). University Park houses almost all of the university's colleges and schools as well as all the administrative offices and main university facilities. University Park is also home to the Ronald Reagan Presidential House, the home of FIU's president, the Wertheim Performing Arts Center, the Frost Art Museum, the International Hurricane Research Center, and the university's athletic facilities such as FIU Stadium, FIU Arena, and the FIU Baseball Stadium. Located five blocks north of University Park, is the 38-acre (145,000 m2) Engineering Center which houses a part of the College of Engineering and Computing and is the home of FIU's Motorola Nanofabrication Research Facility. The Engineering Center is serviced by the CATS Shuttle, FIU's student buses, which run throughout the day on weekdays connecting the two parts of campus. The site of the campus was originally used for a general aviation airport called Tamiami Airport (not to be confused with Kendall-Tamiami Airport), which was in operation from the 1940s until 1967. The airport had three runways and was used for pilot training, among other purposes. Construction on the FIU campus began in 1965, and the airport closed in 1969. At the time, very little was located around FIU, and the campus was called University Park. As Miami grew west, the area came to be known as University Park after the university's campus name. Until the early 1990s, the runways, parking ramp and other features of Tamiami Airport were still visible on campus and clearly discernible in aerial photos. Construction has removed all of these features, and only the University Tower remains as a memory of the university's past. University Park is a lush, heavily vegetated campus, with many lakes and a 15-acre nature preserve, as well as a palm arboretum and has over 90 buildings. As of late 2009, current construction at University Park includes the Nursing and Health Sciences Building, the School of International and Public Affairs Building, and a fifth parking garage. On June 12, 2009, FIU's Board of Trustees voted unanimously to rename the University Park campus to the Modesto Maidique Campus. However, the change created a large backlash from the FIU community, as many felt it unfitting to name the campus after him. A campaign by FIU students and alumni was created to revert the name change, and to keep the name University Park. A Facebook group, "No to Maidique's Campus" with over 2,000 supporters has made national news, in many newspapers, TV news stations, and collegiate magazines, supporting to keep the name "University Park". The Biscayne Bay Campus in North Miami is FIU's second-largest campus. It was opened in 1977 by Harold Crosby and occupies about 200 acres (809,000 m²), directly on the bay and adjacent to the Oleta River State Park, with which FIU has a research partnership. Access to these resources inspired the creation of a marine biology program on the Biscayne Bay Campus, which has become one of the university's most recognized programs. The Biscayne Bay Campus also houses the School of Hospitality & Tourism Management, the School of Journalism and Mass Communication, the Aquatic Center, and the Kovens Conference Center. The Golden Panther Express, FIU's student buses, connect the main campus and the Biscayne Bay Campus throughout the day on weekdays. After closing Bay Visa Housing to students and long-term leasing the facility to RCL for employee training, FIU is developing BayView Student Housing on the BBC campus. BBC's first on-campus new housing in 30+ years will house 408 students in a high rise overlooking Biscayne Bay. FIU also has other smaller regional centers located throughout South Florida in both Miami-Dade County and Broward County, serving the local communities in research, continuing studies, and in culture. In Broward County, there is the FIU Pines Center in Pembroke Pines, opened to satisfy the demand from Broward County residents. This center serves mostly night students in programs within the College of Business Administration. In Miami-Dade County, there are four regional FIU facilities, the Downtown Miami Center, the Wolfsonian-FIU Museum in Miami Beach (Washington Avenue and 10th St), the FIU-Florida Memorial research center in Miami Gardens, and a research site in Homestead. FIU has a center on Brickell Avenue in Downtown Miami at 1101 Brickell Avenue dubbed "FIU Downtown on Brickell". FIU's College of Business Administration has had classes at the Burdines Building on Flagler Street and the Metropolitan Center had offices at 150 SE 2nd Ave since 2004. In August 2011, FIU expanded its Downtown center to 1101 Brickell with the expansion of course offerings for the College of Business Administration and the School of International and Public Affairs, as well as with FIU's research center, the Metropolitan Center. Most programs in Downtown are graduate-level evening courses geared for Downtown professionals and residents. As of Spring 2011, there were approximately 500 students enrolled at the Downtown center, with plans to grow the center to over 2,000 students by 2021. FIU Tianjin Center in Tianjin, China. FIU also has international campuses in Asia and Europe. The Wolfsonian-FIU Museum has a regional facility in Nervi, Italy, the School of Architecture has facilities in Genoa, Italy for FIU's upper-division and graduate Architecture students, and the Florida International University Tianjin Center in China, from which a branch of the School of Hospitality & Tourism Management operates. The Tianjin Center was constructed as a cooperative venture with the local municipal government and was opened in the Summer of 2006. FIU has also exchanged agreements with the American University in Dubai so that FIU students can now take a semester abroad in Dubai. FIU students can also study abroad in Paris, France via MICEFA. University Park Towers, graduate student and upperclassmen apartments. Florida International University's student housing facilities are managed by the Office of Housing and Residential Life and are available on both the main campus and the Biscayne Bay Campus. Currently, there are 3,009 beds distributed throughout 10 apartment buildings and 6 residence halls. At University Park, these are the University Park Apartments, Panther Hall, the University Park Towers, Everglades Hall, Lakeview Hall North, and Lakeview Hall South. On the Biscayne Bay Campus, after closing Bay Visa Housing to students and long-term leasing the facility to RCL for employee training, FIU is developing BayView Student Housing on the BBC campus. BBC's first on-campus new housing in 30+ years will house 408 students in a high rise overlooking Biscayne Bay. Together, approximately 7% of FIU's student population lives on-campus in student housing (not including Greek housing). The Office of Housing and Residential Life also offers optional communities in the residence halls. These communities include the Architecture and Arts Community, for students majoring in Architecture or art-related majors, Honors Place for Honors College students, F.Y.R.S.T. (First Year Residents Succeeding Together) for all freshmen in any major, F.Y.R.S.T. Explore, for undecided freshmen, Leader's in Residence for students interested in civic service and leadership opportunities and the Law Community for College of Law students. As of 2011[update], plans are underway for two new residence halls for 1,240 students, called Parkview Hall to be built on the Panther Hall parking lot, north of FIU Stadium. Parkview Hall will be built in two phases in two separate buildings, each housing 620 and 600 students respectively, to be completed by Fall 2013 and Fall 2016. Green Library, is one of the largest libraries in the Southeastern U.S. and is the largest building on-campus. FIU has six libraries, Green Library, FIU's main library; the Glenn Hubert Library (Biscayne Bay Campus), the Wolfsonian Library, the Engineering Library, the Law Library, and the Medical Library. The Green Library, Hubert Library, and Engineering Library Service Center are under the direction of the Dean of University Libraries. Other libraries are overseen by their appropriate schools or organizations. The Green Library is FIU's main library, is the largest building on campus, and one of the largest library buildings in the Southeastern United States. Originally designed by Architect David M. Harper in 1973, the Green Library was expanded by the architecture firm M. C. Harry & Associates, Inc. in the early 1990s to its current eight floors, with a capacity to expand to a total of 15 floors, if necessary. The eight-floor structure was built over, through, and around the original three-story library while it was still in use. The first floor has numerous classrooms, auditorium spaces, and support services for students, such as tutoring, the writing center, and technology assistance. Also on the first floor is a snack stop and a Starbucks. The second floor has the reference section, cartography (GIS Center), circulation, and numerous computer and printing labs. The third floor is the home of the Medical Library, and includes study lounges as well as a resource center for students of the Honors College. The fourth floor houses the special collections department and university archives. The fifth floor is the home of the School of Architecture Library, as well as the music and audiovisual collections. The sixth and seventh floors are strictly quiet floors, and contain the general book collection plus numerous student study lounges. The eighth floor contains the library's administration offices and technical services departments. The Engineering Library is located on the second floor of the main building of the Engineering Center. The Law Library opened in 2002, and has three floors, with all three holding the library's general collection. The third floor has a two-story, quiet reading room, as well as numerous study lounges. Although the Law Library is restricted to Law students, other students may use the library for research purposes. The FIU Medical Library opened in August 2009 at the same time as the opening of the Herbert Wertheim College of Medicine. The Medical Library offers a rich array of resources, services, and instructional support to advance the teaching and learning, discovery, and healthcare programs of the Herbert Wertheim College of Medicine and is currently located on the third floor of Green Library building. Future construction of buildings for the College of Medicine will include a new space for the Medical Library outside of Green Library, based upon funding and space availability. The Glenn Hubert Library, previously named the 'Biscayne Bay Library', is the library for the Biscayne Bay Campus. Although a smaller structure, three stories, the Hubert Library is nonetheless important to the research and information needs of the BBC Campus students and faculty. All services at the Green Library are available in the Hubert Library. The Wolfsonian Library is located at the Wolfsonian-FIU Museum in South Beach, on the corner of Washington Avenue and 10th Street. The collection focuses exclusively on architecture, art, design, and history of the Western World from 1885 to 1945. The library serves mostly as a research library with an extensive collection of primary sources. For students, prior approval from the staff is needed to enter the library. Together, the entire FIU university-wide Library holdings include over 2,097,207 volumes, 52,511 current serials, 3,587,663 microform units, and 163,715 audio visual units. The International Hurricane Research Center (IHRC) is the nation's only university-based research facility dedicated to mitigating the damage tropical storms inflict on people, the economy, and the environment. The IHRC is home to four institutes: the Laboratory for Coastal Research; the Laboratory for Social Science Research; the Laboratory for Insurance, Financial & Economic Research; and the Laboratory for Wind Engineering Research, as well as the FIU Wall of Wind. The 12-fan Wall of Wind (WOW) at FIU is the largest and most powerful university research facility of its kind and is capable of simulating a Category 5 hurricane – the highest rating on the Saffir-Simpson Hurricane Wind Scale. In 2015 the National Science Foundation selected the 12-fan WOW as one of the nation's major "Experimental Facilities" under the Natural Hazards Engineering Research Infrastructure (NHERI) competition. Not to be confused with the National Hurricane Center (also located at University Park), the IHRC is located on the western side of the campus. FIU has over 30 fraternities and sororities divided into four governing councils: the Interfraternity Council (IFC), the Panhellenic Council (PC), the National Pan-Hellenic Council (NPHC), and the Multicultural Greek Council (MGC). The Order of Omega, a Greek honor society, has had a chapter at the university since 1991 and represents the academic top 3% of FIU Greeks. The Interfraternity Council (IFC) comprises 13 fraternities. The Panhellenic Council (PC) is made up of 7 sororities. The National Pan-Hellenic Council (NPHC) comprises 6 historically black organizations, (4 fraternities and 2 sororities). The Multicultural Greek Council (MGC) consists of 9 cultural organizations for Latinos, Asians, and South Asians, (5 fraternities and 4 sororities). Lakeview Hall North and South residence halls. 6% of FIU students live on-campus. FIUSM is the umbrella organization for The Beacon, the student-run newspaper; FIUSM.com, the student-run news and media website; and WRGP Radiate FM, the student-run radio station. Each organization's directors are selected by the Student Media board on a yearly basis. The Beacon is the FIU student newspaper since 1965. The Beacon is published thrice weekly in a compact format during the Fall and Spring semesters (Monday, Wednesday and Friday) and once a week on Wednesday during the Summer.The Beacon is available free campus-wide in the residence halls, the Graham Center and all campus buildings. FIUSM.com is the FIU student-run media website since 2008. FIUSM.com publishes content generated by the Student Media team, including text, audio, and video. WRGP Radiate FM is FIU's student-run radio station since 1984. It broadcasts on 95.3 MHz at the University Park Campus and on 96.9 MHz at the Biscayne Bay Campus. The signal originates in Homestead on 88.1 MHz and a broadcast translator rebroadcasts WRGP's signal to the University Park Campus and later again translated to the Biscayne Bay Campus. FIU has three museums, the Frost Art Museum, the Wolfsonian-FIU Museum and the Jewish Museum of Florida. The Frost Art Museum is located on Modesto A. Maidique campus and was opened in 1977 as The Art Museum at Florida International University. The Frost Art Museum's Permanent Collection consists of a broad array of art objects from ancient cultural artifacts to contemporary works of art. The Wolfsonian-FIU Museum is located in Miami Beach and promotes the collection, preservation and understanding of decorative art and design from the period from 1885 to 1945. FIU also has a large sculpture collection, named the Sculpture Park at FIU, with sculptures from such prominent artists as Anthony Caro, Jacques Lipchitz, Daniel Joseph Martinez, and Tony Rosenthal. Many different art structures, statues, paintings and mosaics can be seen throughout campus in gardens, buildings, walkways, and on walls. The School of Music presents an annual series of concerts that showcase talent in a variety of genres. School of Music at FIU offers a dynamic learning environment for informed, creative musicians. Students are fully involved in their chosen fields, where they can recognize clearly what they need to learn in order to become contributors to those fields. FIU's School of Music embraces an evolving world for its possibilities and the new opportunities and challenges that it affords, while providing the tools necessary to empower young musicians in their quest to carve out careers. FIU School of Music's concert season incorporates music of all styles including jazz, early music, chamber music, choral/vocal, contemporary music, wind, and opera theater performed by world class musicians and ensembles. Many masterclasses and lectures are also open to the public and offered at no charge. The season runs from August through April each year. The Department Theatre presents a season of four professionally designed, produced and directed productions each year that serve as a laboratory for students to put their learning into practice. This Main Stage season is presented at the Herbert and Nicole Wertheim Performing Arts Center. In addition to Main Stage productions students write, direct and perform productions in the Student Theatre Lab Studio, the annual New Plays Festival, and the summer Alternative Theatre Festival. The summer Alternative Theatre Festival includes a development project of a new work by an established playwright, a faculty directed piece, one student directed piece, and may include Alumni showcase and reunion productions. FIU annually hosts the Food Network South Beach Wine & Food Festival in South Beach through the School of Hospitality & Tourism Management, a major national culinary event. The Walk on Water race held annually by the School of Architecture. The Student Government Association presides over and funds the over 300 student clubs and organizations and honor societies at the university and has an operating budget of over $14 million. The Student Government Association is split into three branches, with the Executive, a Legislative Student Senate, and Judicial Supreme Court. Due to the unique nature of a multi-campus university, the president of Modesto Maidique Campus (University Park) serves as the student representative on the university's board of trustees, while the president for the Biscayne Bay Campus serves as a member of the Foundation Board. The Student Government contains five separate governing councils- the Student Programming Council, the Council for Student Organizations, which represents the over 200 or more student clubs and organizations, the Homecoming Council, Black Student Union, and Panther Power, the student spirit group. The Panther Power group can be seen in all Golden Panthers athletic events along with the Golden Panthers Band, the Golden Dazzlers dance team and the Golden Panthers cheerleaders. In 2004, MTV's Campus Invasion Tour was held at FIU, bringing numerous bands such as Hoobastank to FIU. The Order of the Torch is a semi-secret honorary leadership society akin to other secret societies in the state such as Florida Blue Key at the University of Florida, and the Iron Arrow Honor Society at the University of Miami. The organization is rumored to have been founded in 2003 as a way of organizing student leadership to restructure student life to mirror that of a traditional university. Members now include students, faculty, staff and community members, including FIU alumni Miami-Dade County Mayor Carlos Alvarez (class of 1974). Top leadership in Student Government, Homecoming, and the most elite campus fraternal organizations, rank among its members. Green Library and Owa Ehan. FIU has many traditions from student spirit groups, alumni association events and student spirit events. Panther Rage, one of FIU's largest student spirit groups are seen at all the athletics events. FIU also holds many Golden Panther spirit events throughout the year. Some of these include, Panther Camp held in the Summer prior to the Fall term for incoming freshmen, where students spend a weekend in a retreat center learning all the traditional Golden Panther cheers, chants, traditions meeting other incoming students. Started in 2006, Panther Camp has grown quickly in popularity from only 25 participants in 2006 to over 120 participants in 2007. In 2008, Panther Camp expanded to two camps with a combined total of 240 freshman participants. Panther Camp is expected to grow in size for Summer 2010, as the waiting list has continued to double from year to year. Freshmen who participate are more likely to get involved in Student Life than other students. Week of Welcome, usually held the first or second week of the Fall semester holds many spirit events, such as Trail of the Torch. Trail of the Torch is another university tradition that has continued to grow annually, where a pep rally is held in the Housing Quad with music, food, giveaways and dancing. After the pep rally, the torch of knowledge is lit and blue and gold candles are distributed to the crowd for the procession around the campus, trailing the torch from the Housing Quad to the torch in front of the Primera Casa building. Rage Week and Homecoming Week are other major back-to-back spirit weeks held in the Fall semester. They include the Homecoming Parade, Greek Row parties, Homecoming football game, Blue/Gold Party, pep rallies and other Panther Rage events. Golden Panthers fans at FIU Stadium. The Panthers football team plays at the on-campus Riccardo Silva Stadium. Florida International University has seventeen varsity sports teams, named the Panthers. The Panthers' athletic colors are blue and gold, and compete in the NCAA Division I as part of Conference USA in all sports. Three main sports facilities serve as home venues for Panther athletics. The Panthers football team plays at FIU Stadium ("The Cage"), the men and women's basketball and volleyball teams play at the FIU Arena, and the men's baseball team plays at FIU Baseball Stadium. Other athletics venues include the Aquatic Center, Tennis Complex, softball fields, and various other recreational fields. FIU Arena underwent expansion to add more seating and a modernization of the exterior that was completed in late 2011. On July 1, 2013, FIU became a member of Conference USA. Traditional rivals of the FIU Panthers include Florida Atlantic University and the University of Miami. The Panthers football team competes in the annual Shula Bowl, a yearly football game played for the Don Shula Award against in-state rival Florida Atlantic University. Due to this competition in the Shula Bowl, the rivalry between the two schools has grown, with the rivalry extending into the men's baseball and basketball teams as well. The Panthers football team plays home games at Riccardo Silva Stadium nicknamed "The Cage" and are currently coached by Butch Davis. In 2005, the Panthers moved to the Sun Belt Conference, making their transition from Division I-FCS to Division I-FBS complete. In their first season in the conference, the Panthers began by finishing 5–6. FIU's athletics department has produced many professional and Olympic athletes, including current players in Major League Baseball, Major League Soccer, National Basketball Association, National Football League and the Women's National Basketball Association. Notable alumni include Mike Lowell (Boston Red Sox), Raja Bell (Utah Jazz), and Carlos Arroyo (Boston Celtics). During his pro career in the 1970s, NFL offensive lineman Ed Newman worked as an assistant coach of the Florida International University wrestling team in the off-season. In 2009, FIU hired NBA Hall of Famer Isiah Thomas as head coach of the men's basketball team. In 2010, the Panthers football team finished the season #1 as Sun Belt Conference champions, and went on to the Little Caesars Pizza Bowl against Toledo on December 26, 2010. The game was won 34–32 in a fourth quarter play that became known as the "Motor City Miracle". On September 8, 2017, FIU faced up against willing opponent, the Alcorn State Braves in Birmingham, AL. An event known globally as 'the most lunch pail carrying, low pad level, football guys guys tailgate of all time' in reference to the display of pregaming that happened prior to the game. FIU currently has over 180,000 alumni around the world in more than 30 countries. FIU graduates more than 10,000 students a year and confers more than half of all degrees awarded by universities in Miami. Alumni services is run by the Florida International University Alumni Association, which sponsors numerous alumni events, galas, and ceremonies annually. In conjunction with the Office of Alumni Relations, the Division of External Affairs publishes a quarterly news and alumni magazine, "FIU Magazine". FIU Magazine is distributed free of charge to all FIU alumni, faculty and donors. FIU's campus has been the set for many films, television shows, and music videos. One of the earliest television shows to have filmed at FIU was Miami Vice in 1985. In the episode, "The Fix", the FIU Arena was used as one of the scenes. The TV show Burn Notice has also filmed various episodes at FIU, with scenes at the College of Business Buildings and the Diaz-Balart College of Law Building. In 2007, Chris Brown filmed the music video for his song "Kiss Kiss" at FIU, with scenes near the Frost Art Museum and around the Graham Center. Various telenovelas for Telemundo and Univision have filmed television episodes at FIU as well. In 2007, Telemundo's Pecados Ajenos was filmed in the Graham Center. In 2009, TLC's What Not to Wear filmed an episode on campus at the Management and Advanced Research Center. In October 2009, former CNN news anchor Rick Sanchez broadcast his CNN show from the Graham Center at FIU. The new A&E show The Glades shot an episode at University Park, using the Frost Art Museum as a background and the Health and Life Sciences building as the façade for a NASA Administrative Building. In 2011, the FIU Drumline appeared in the music video "Champion" by Nelly. The FIU Band and Drumline continue to take part in many parades, and shows, including appearances on Univision, the 2011 Florida Lottery commercial, and many others. In 2012, G4TV held the Northeast and Southeast regional qualifying rounds of the television show American Ninja Warrior at FIU. The competition took place in the traffic loop between the School of Architecture and the College of Business. In 2015, Florida International University hosted the Miss Universe 2014 pageant in the FIU Arena. ^ As of June 30, 2017[update]. "U.S. and Canadian Institutions Listed by Fiscal Year (FY) 2017 Endowment Market Value and Change in Endowment Market Value from FY 2016 to FY 2017" (PDF). National Association of College and University Business Officers and Commonfund Institute. 2018. Archived from the original (PDF) on March 6, 2018. Retrieved January 30, 2018. ^ a b c d e f "FIU : Accountability Dashboards : AIM". aim.fiu.edu. ^ "Logo Standards". Brand Florida International University - FIU. Archived from the original on January 31, 2016. ^ "2010 CENSUS - CENSUS BLOCK MAP: University Park CDP, FL" (Archive). United States Census Bureau. Retrieved on January 3, 2015. ^ "FIU Campus Maps Archived March 23, 2017, at the Wayback Machine." Florida International University. Retrieved on April 27, 2011. ^ "Carnegie Classification for FIU". Carnegie Foundation for the Advancement of Teaching. 2016. Retrieved March 26, 2016. ^ "2008 Fact Book" (PDF). Archived from the original (PDF) on June 12, 2009. ^ "FIU, Did You Know?". Archived from the original on June 12, 2007. Retrieved June 1, 2007. ^ "Metro Atlantic". Retrieved September 20, 2014. ^ a b "Miami Today". Retrieved August 28, 2008. ^ "Money FIU's Bay Vista project should be used to benefit students - PantherNOW". October 14, 2015. ^ a b c d e "History from 1943 to 1979". Archived from the original on February 2, 2009. Retrieved November 9, 2007. ^ "Graham Center information". Archived from the original on December 6, 2008. Retrieved November 14, 2008. ^ a b "History from 1979 to 1986". Archived from the original on September 6, 2007. Retrieved November 9, 2007. ^ "University Park CDP, Florida[permanent dead link]." ^ "About: Past Presidents". Retrieved September 11, 2013. ^ a b "FIU President Modesto Maidique stepping down". Retrieved September 11, 2013. ^ "Florida International University". Archived from the original on May 11, 2014. Retrieved September 11, 2013. ^ "The Phi Beta Kappa Society". Archived from the original on June 15, 2009. Retrieved September 11, 2013. ^ "President Maidique resigns". Retrieved November 14, 2008. ^ "Rosenberg signs five-year contract to lead university". Retrieved September 11, 2013. ^ Lanza, Lissette. "FIU to Usher in New Era with Installation of Mark B. Rosenberg as its Fifth President on Friday". Retrieved October 9, 2009. ^ "FIU growth and expansions". Retrieved May 19, 2007. ^ "FIU receives largest gift in university history". Retrieved September 11, 2013. ^ a b c d e "Quick Facts about FIU". Archived from the original on August 16, 2011. Retrieved May 19, 2007. ^ "History from 1986 to Today". Archived from the original on September 7, 2007. Retrieved November 9, 2007. ^ "FIU Tianjin Center". Archived from the original on October 6, 2007. Retrieved September 21, 2007. ^ a b "FIU Hospitality Management Campus in China". Retrieved September 21, 2007. ^ Miss Universe Organization. "Miss Universe Pageant - Host Venue". Retrieved August 28, 2015. ^ "Florida university bridge collapses 'leaving people trapped'". BBC News. March 15, 2018. Retrieved March 15, 2018. ^ "FIU presidents". Archived from the original on April 21, 2008. Retrieved September 23, 2008. ^ a b Florida International University - Web Communications. "Costs & Aid - Florida International University - FIU". Retrieved August 28, 2015. ^ a b "2014-2015 Common Data Set" (PDF). Florida International University. May 22, 2015. Retrieved May 22, 2015. ^ "Florida QuickFacts". United States Census Bureau. 2014. Archived from the original on May 8, 2013. Retrieved June 24, 2014. ^ "Florida International University: Fall 2005 enrollment data" (PDF). Retrieved May 24, 2007. ^ "Florida International University: Fall 2007 data" (PDF). Retrieved October 27, 2007. ^ a b "State University System of Florida Facts and Figures" (PDF). State University System of Florida. Retrieved May 22, 2015. ^ "FIU facts" (PDF). Retrieved November 2, 2007. ^ "Archived copy". Archived from the original on February 3, 2009. Retrieved 2007-05-24. CS1 maint: Archived copy as title (link) Florida International University: OPIE Retrieved on 5-24-2007. ^ "FIU Herbert Wertheim College of Medicine to welcome class of 2014". News.fiu.edu. Retrieved April 9, 2014. ^ "Master of Architecture". Archived from the original on October 23, 2009. ^ "School of Architecture". FIU. ^ "FIU Colleges and Schools". Archived from the original on April 18, 2008. Retrieved March 12, 2012. ^ "Degree Programs - Academics - Florida International University - FIU". Fiu.edu. Retrieved April 9, 2014. ^ "FIU Colleges & Schools". FIU. March 12, 2012. Retrieved March 12, 2012. ^ "Grade Inflation: Colleges With the Easiest and Hardest Grades". CBS News. ^ "FIU, youngest university awarded PBK chapter". Archived from the original on September 3, 2007. Retrieved January 10, 2008. ^ "FIU: Carnegie Foundation rankings and Phi Beta Kappa". Archived from the original on April 16, 2008. Retrieved January 10, 2008. ^ "Achievements". Archived from the original on April 29, 2010. Retrieved September 11, 2013. ^ "FIU 97th on Kiplinger's best value list". January 5, 2011. Retrieved September 11, 2013. ^ "Top 100 Degree Producers: Baccalureate". Archived from the original on July 14, 2014. Retrieved July 4, 2014. ^ "Top 100 Degree Producers: Graduate and Professional". Archived from the original on July 14, 2014. Retrieved July 4, 2014. ^ "FIU No. 1 in SUS in energy conservation". News.fiu.edu. February 12, 2014. Retrieved April 9, 2014. ^ "Business School rankings". Retrieved May 22, 2015. ^ "ERROR 404". Retrieved September 20, 2014. ^ a b c "Rankings and Recognition". Retrieved August 28, 2015. ^ "FIU No. 8 in undergraduate international business in U.S. News 2015 rankings". News.fiu.edu. February 12, 2014. Retrieved April 9, 2014. ^ "FIU College of Business among world's best programs". Archived from the original on December 19, 2007. Retrieved May 20, 2007. ^ "FIU MBA program the highest ranked in Florida". Archived from the original on May 2, 2007. Retrieved May 20, 2007. ^ "Executive MBA program ranked top 35 in U.S." Archived from the original on December 5, 2008. Retrieved November 2, 2008. ^ a b "College's MBA programs garner increasing recognition in rankings". Business.fiu.edu. Retrieved April 9, 2014. ^ "QS Global 200 MBA Rankings 2014/15: North America". TopMBA.com. Retrieved August 28, 2015. ^ "Best Value Law Schools". Retrieved October 12, 2010. ^ "FIU Law ranked Top 10 Best Value School". Retrieved October 12, 2010. ^ "JULY 2014 GENERAL BAR EXAMINATION: OVERALL METHOD". September 22, 2014. ^ a b c "FIU Law School with highest passing rate in Florida". Archived from the original on July 21, 2010. Retrieved November 22, 2007. ^ "FIU Law School, MPRE". Archived from the original on February 2, 2009. Retrieved January 10, 2008. ^ "FIU Board of Trustees meeting November 2007" (PDF). Archived from the original (PDF) on February 16, 2008. Retrieved December 13, 2007. ^ "Social welfare PhD faculty rank No. 4 in U.S." Archived from the original on January 5, 2008. Retrieved December 13, 2007. ^ "FIU Engineering Center". Archived from the original on December 13, 2007. Retrieved November 10, 2007. ^ a b Freeman, Paul. "Abandoned & Little-Known Airfields: Florida: Central Miami Area". Retrieved February 5, 2016. ^ "History of FIU video". Archived from the original on October 17, 2007. Retrieved November 10, 2007. ^ "FIU Stadium construction information". Archived from the original on July 16, 2012. Retrieved September 23, 2008. ^ "Students rally online against renaming of campus". FIUSM. Archived from the original on July 10, 2012. Retrieved September 20, 2014. ^ "FIU Campus Maps - Florida International University". Retrieved September 20, 2014. ^ "FIU Hospitality Management, top U.S. program". Retrieved January 10, 2008. ^ "Golden Panther Express schedules". Archived from the original on April 16, 2007. Retrieved May 19, 2007. ^ "Apartments in North Miami For Rent - Bayview". Bayview. ^ "FIU signs $12M lease in downtown Miami". March 23, 2011. ^ "FIU to open Brickell Ave. facility in Fall 2011 with a focus on international leadership". FIU News. Retrieved September 20, 2014. ^ "FIU establishes exchange agreement with American University in Dubai". FIU News. Retrieved September 20, 2014. ^ "Apartments in North Miami for rent". Bayview. ^ "Residence hall communities". Archived from the original on March 21, 2007. Retrieved November 10, 2007. ^ "BT-889 Parkview Housing AE Project Fact Sheet" (PDF). Archived from the original (PDF) on July 22, 2011. Retrieved 2011-05-29. ^ "About Us | FIU Libraries". libraries.fiu.edu. Retrieved October 25, 2018. ^ "FIU Library – Library for the 21st Century". Archived from the original on October 7, 2008. Retrieved December 19, 2008. ^ "FIU News". FIU News. Retrieved September 20, 2014. ^ "MCHarry Associates - Project". Archived from the original on October 18, 2015. Retrieved August 28, 2015. ^ "CampusDish at Florida International University-Green Library". Archived from the original on November 21, 2010. Retrieved November 7, 2010. ^ "FIU Campus Information". Archived from the original on November 13, 2013. Retrieved September 11, 2013. ^ "library administration". Archived from the original on August 24, 2009. ^ "Engineering Library Services". Archived from the original on November 13, 2013. Retrieved September 11, 2013. ^ "Law Library". Archived from the original on June 1, 2009. ^ "FIU Medical Library". Retrieved September 11, 2013. ^ "FIU Libraries" (PDF). Archived from the original (PDF) on November 29, 2007. Retrieved November 9, 2007. ^ "Facility Overview". Retrieved February 2, 2016. ^ "NSF Announces Natural Hazards Engineering Research Infrastructure (NHERI) Experimental Facility Award – Wall of Wind (WOW) Facility at FIU receives $4.1 million NSF Award". Retrieved February 2, 2016. ^ "Florida International University Facilities Management". Retrieved November 10, 2007. ^ "Metrobus - Miami-Dade County". Retrieved September 20, 2014. ^ "Taken For A Ride". Miami Herald. June 2009. Retrieved March 15, 2014. ^ "Miami's Long-Sought Plans for Metro Extensions Dissolve as Funding Disappears". The Transport Politic. July 12, 2010. Retrieved March 15, 2014. ^ "Greek Life at FIU". Retrieved May 12, 2008. ^ "Multicultural Greek Council - Office of Sorority & Fraternity Life | Florida International University". Retrieved June 8, 2015. ^ "Panhellenic Council at FIU". Archived from the original on May 1, 2011. Retrieved May 12, 2008. ^ "National Pan-Hellenic Council - Office of Sorority & Fraternity Life | Florida International University". Retrieved June 8, 2015. ^ "The Beacon, student newspaper of FIU". Retrieved May 19, 2007. ^ "Radiate FM, The Beacon launch new Web site for FIU community". Archived from the original on July 20, 2012. Retrieved August 12, 2008. ^ "WRGP Radiate FM, FIU student radio". Archived from the original on May 31, 2007. Retrieved May 19, 2007. ^ "History of WRGP Radiate FM". Archived from the original on August 30, 2007. Retrieved November 10, 2007. ^ "Histort - Frost Art Museum". Archived from the original on April 6, 2011. Retrieved April 24, 2012. ^ "Wolfsonian-FIU Museum". Archived from the original on June 3, 2007. Retrieved September 24, 2008. ^ "Arts and Culture at FIU". Archived from the original on October 24, 2007. Retrieved November 10, 2007. ^ "Sculpture Park Brochure" (PDF). Frost Art Museum. Archived from the original (PDF) on September 7, 2007. ^ "Frost Art Museum". Archived from the original on September 1, 2006. Retrieved November 22, 2007. ^ "FIU's South Beach Wine & Food Festival". Archived from the original on November 12, 2007. Retrieved November 10, 2007. ^ "Student Government Association Activities and Service Fees Budget 2007– 2008". Archived from the original (PDF) on September 8, 2007. Retrieved January 1, 2008. ^ "FIU student spirit organizations". Archived from the original (PDF) on April 2, 2007. Retrieved June 1, 2007. ^ "Panther Rage, largest spirit group". Archived from the original (PDF) on June 26, 2007. Retrieved June 1, 2007. ^ "Hoobastank, Lostprophets To Invade College Campuses". MTV News. Retrieved September 20, 2014. ^ "Panther Rage and Campus Life". Retrieved September 23, 2008. ^ "Changes to GRE have some students changing plans". FIUSM. Archived from the original on July 10, 2012. Retrieved September 20, 2014. ^ "Golden Panther athletic facilities". Archived from the original on January 14, 2009. Retrieved November 10, 2007. ^ "2005 Shula Bowl". Archived from the original on February 3, 2009. Retrieved November 10, 2007. ^ "2005 Golden Panthers football season". Retrieved November 10, 2007. ^ "Isiah Thomas named basketball coach at FIU". ESPN.com. April 14, 2009. Retrieved November 18, 2017. ^ "FIU Hires Isiah to be Head Coach". CBS. April 14, 2009. Retrieved May 5, 2009. ^ Adam H. Beasley (December 27, 2010). "FIU wins thriller in Detroit". Miami Herald. Archived from the original on November 9, 2011. ^ "About Us". FIU Alumni Association. Retrieved August 28, 2015. ^ "FIU Alumni data" (PDF). Retrieved June 16, 2007. ^ "FIU Alumni Association - Your Panther Network". Retrieved September 20, 2014. ^ "Burn Notice brings lights, camera, action to campus". Retrieved September 11, 2013. ^ "ISSUU - FIU Magazine - Winter 2008 by Florida International University". Issuu. Retrieved September 20, 2014. ^ "CNN's Rick Sanchez: Live from the Pit at FIU". FIU News. Retrieved September 20, 2014. ^ "American Ninja Warrior FAQ". Retrieved March 29, 2013. ^ "FIU to host the Miss Universe Pageant".